When we refer to wind energy we mean the kinetic energy of air in motion. The way wind gets in motion is from the temperature differences and the atmospheric pressure caused from the sun radiation i.e. sunlight so essentially wind energy is a by product of solar energy. Thus like solar energy wind energy is sustainable for as long as we have the sun at least. How is wind energy used? Today the first thought that comes to mind when we talk about wind energy is the production of clean electricity. But this was not always the case. Since ancient times wind energy has been harnessed by people. One of the first uses was in ships using sails to travel for commercial reasons or for war. Later on windmills became an important element of farming. They were used for pumping water and irrigation purposes and are still used in many parts of the world. Nowadays wind energy is used also for entertainment purposes such as wind surfing and kite surfing. Wave energy is produced from wind energy that can be captured from wave energy converters WECs and transformed into electricity. Thus given the fact that wind energy is produced from solar energy similarly wave energy is also a result of it. We have seen fans and we all know that they use electricity to produce electricity well a wind turbine functions in the exact opposite way a fan works as it takes nature’s wind and transform it into electricity. A wind turbine is located outdoors in an area that is relatively windy and usually there is a number of them that altogether make up what we call wind farm. The way that an area is determined to be windy enough to install a wind turbine is through measurements taken for a period of around 6 to 12 months from special equipment or from already available data from local weather services. Once you have the wind data available then a study is performed to determine the viability of the project and the return on investment ROI of the wind farm. 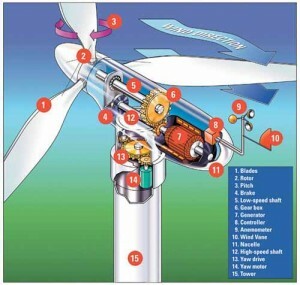 How a wind turbine does turn wind into energy? The concept is pretty simple. The gigantic rotor blades turn as a result of the kinetic energy of the wind. The motion of the blades causes for the rotor shaft to turn. The spinning rotor power is transmitted through the drive shaft and gearbox. At this point the generator converts the kinetic energy into electrical energy. The electricity is then sent to a substation to be converted in order to be able to be sent to the grid and transported via cables to the end user. In the cases of wind farms the energy is sent to a central transformer and from there to the grid. For a typical 2 MW turbine to produce electricity the wind speed must be at least 10 feet per second with optimal level of wind being at 34 to 47 knots beyond that point the turbine’s must be turned off so as to not get damaged. The blades can actually be adjusted to capture the wind’s direction for optimal energy generation since currently the large commercial wind turbine type that has prevailed is the Horizontal one. The vertical type does not need any adjustments as it rotates regardless of the wind direction but currently it is not that popular as other issues exist in their case. It should be noted that today there are also small wind turbines for home that work either with batteries for areas that are far away to be connected to the grid or the ones that get connected to the grid. Usually there is a Fit In Tarrif for the ones that are connected to the grid so you might want to check your area’s FiT schemes as well as the wind levels to determine whether such investment is worth the trouble which will make your home eco friendly. Experts estimate that wind energy can easily cover our energy needs since its potential is estimated at 3600 TW so given that our needs are just 0.5% of these quantity it seems that we are now at the starting point of taking advantage of this amazing Renewable Energy Source. Moreover, it is expected that through research and technological leaps will give us even bigger and more efficient wind turbines.